A panel discusses water and energy issues. Nelson also observed how we often don’t appreciate water until the well is dry, and we don’t appreciate energy until the lights go out. OED director Laura Nelson addresses the forum. Lt. Gov. Spencer J. Cox delivered the keynote address. His remarks focused on the competing interests of urban and rural areas. The Wasatch Front receives much attention because of its dense population, but rural Utah is just as important. Cox said that Utah’s population, which recently reached three million, is expected to double by 2050, creating additional demand for water resources. “Water is the limiting factor to growth,” he said. Meeting additional demand will require proactive planning. “Water is one of those problems you can’t just fix [when it comes up],” Cox said. 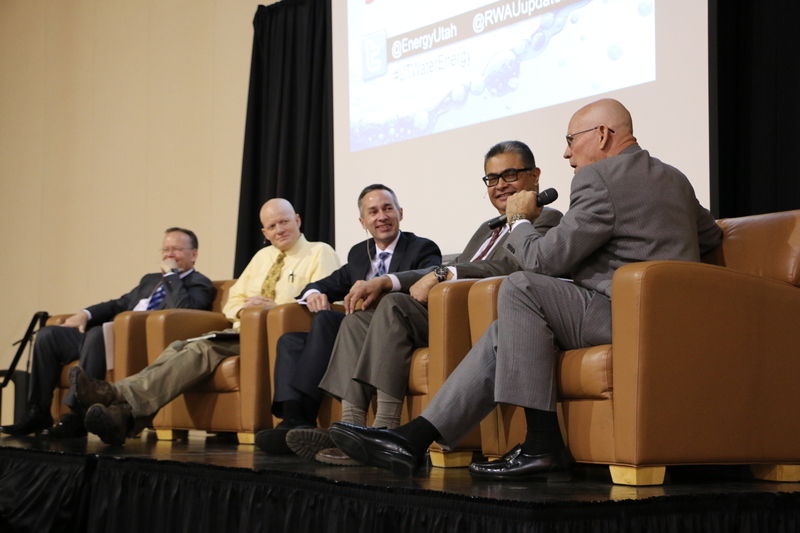 A panel discussion addressed water and energy challenges and potential solutions. Panelists explained that there is no panacea for future water supplies, but that meeting the new demand will require a combination of conservation, reuse, and new water development. 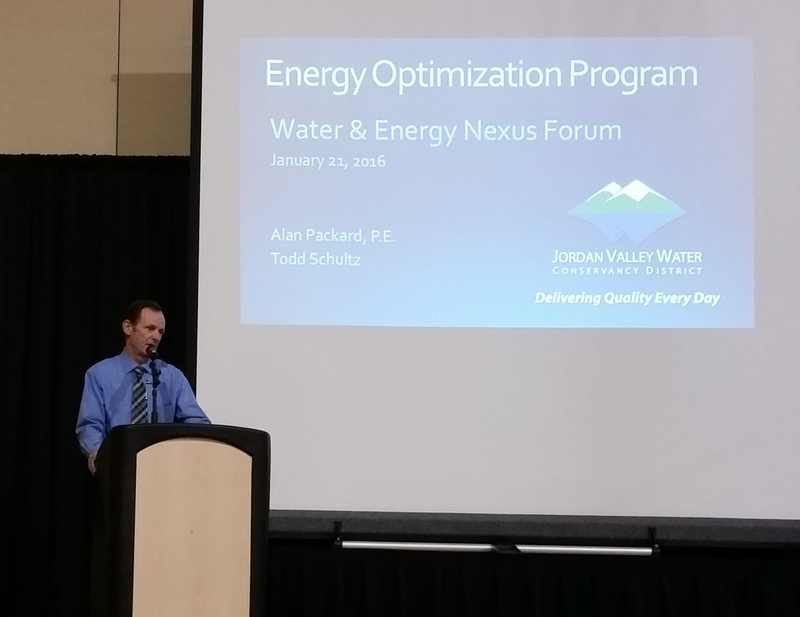 Representatives of Jordan Valley Water Conservancy District, one of the largest water suppliers in the state, shared how the District has been pursuing energy efficiency over the past few years. In 2015, the District managed to save 3.9 million kilowatt-hours of electricity, or 10% of its typical consumption, surpassing the original goal of 1 million kilowatt-hours. The financial benefits have amounted to $435,000 in direct energy savings, plus additional incentives from Rocky Mountain Power. Cascade Energy and Hansen, Allen & Luce assisted the District’s internal energy team in pursuing energy efficiency. A new case study and blog post published by the Utah Department of Environmental Quality describe the district’s strategies and results. Alan Packard presents results of Jordan Valley Water’s energy management program. Dave Pearson described Salt Lake City’s first micro-hydro project, aimed at recovering energy from a large pressure-reducing valve (PRV) station on 500 South. Sen. Margaret Dayton (R-Orem), who chairs the Water Development Commission, provided the legislative update, focusing on last year’s Gold King Mine spill and potential action by the attorney general. 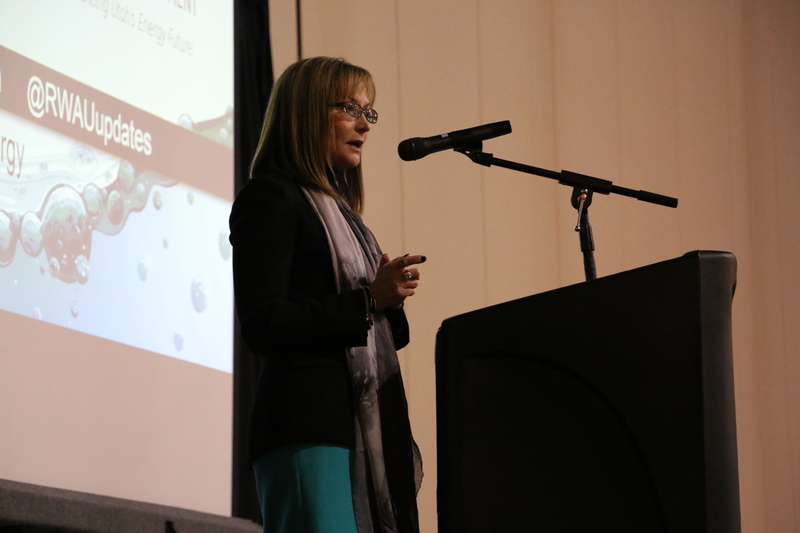 Other topics included drought history, wastewater energy recovery, and Rocky Mountain Power wattsmart Business incentives for water utilities to undertake energy-saving projects. Robert B. Sowby is a water resources engineer at Hansen, Allen & Luce. A graduate of BYU, MIT, and the U, he has contributed to over 100 civil, water, and environmental projects throughout North America.